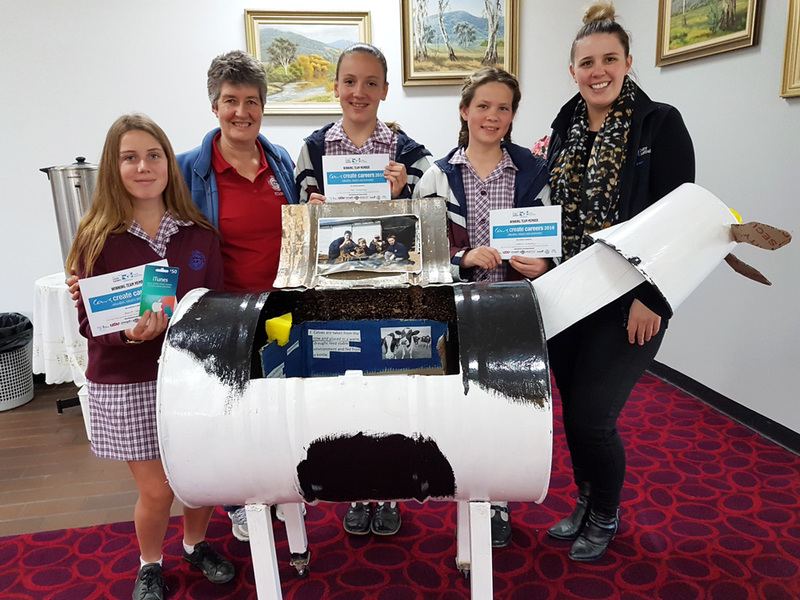 Our school has been lucky enough to participate in the Cows Create Careers Project, that is created by Dairy Australia. Only two year 7 classes participated in the program, 7.3 and 7.8. We had 2 calves (Raichu and Lexi) which we kept in a pen at the back of the Year 9 rooms. We took it in turns to feed, weigh, measure and look after the little calves. The Cows Create Careers Project allows you to explore the farming industry more with having to look after the calves and also completing a project. The project consisted of three different parts: Researching and either making a Moovie, Animation, Powerpoint or a Slideshow, then a letter or a report to Dairy Australia, last of all, we had to take a funny/creative photo with the calves. Last Wednesday seven teams from Galen attended the Presentation at the Wodonga Bowling Club. Ten other schools were in attendance as well, from across NE Vic and the Hume Region. The presenters organised lots of activities that we competed in. There was lots of smiles, laughter and lots of cheering. At the end of the day the awards were presented, we had two groups who came an equal third and our group that came first! The Cows Create Careers Project was really fun and exciting and we would like to thank Ms Timms for all the hard work that she put into our classes.